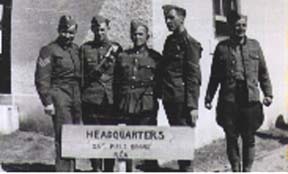 The HQ Staff at Camp Shilo about 1940. The Artillery Training Centre (WC) began at The Manitoba Agriculture Centre, Winnipeg- Fort Garry, then moved to Shilo Camp for the duration. 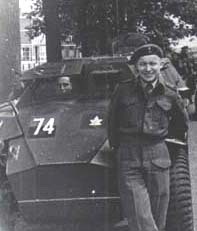 After a gunnery school at Fort Garry, your editor was sent to the Signal Wing and posted to the Canadian Signal Training Centre in Kingston, in 1940 and 1941, returing to Shilo in 1942, and to Officer's Training Centre at Gordon Head, Victoria that year. 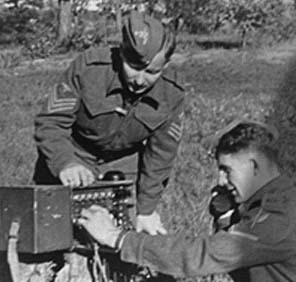 After advanced training at A4 ATC in Brandon, and at A3 ATC, Shilo, it was six months at Debert, Nova Scotia, then overseas in early 1943. This Humber car could travel backwards also! Heading overseas on the SS Beaverhill in early 1944, your editor went through the usual driving drill "on the wrong side of the road" in blacked-out and bombed England, survived two motorcycle courses (to keep us "busy") and numerous firing exercises at the School of Artillery, Seaford Sussex, plus sightseeing in London and visiting relatives, I was posted to 15th Field Regiment, RCA, of 4th Armoured Division in action in Europe. After some weeks of Occupation in Germany, the regiment was withdrawn to Holland, but I managed to get home via the Queen Elizabeth in January 1946.